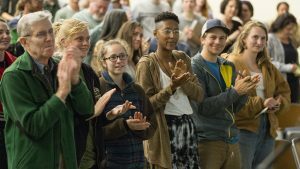 On Thursday, March 30, Dr. Carolyn Finney, author of “Black Faces, White Spaces: Reimagining the Relationship Between African-Americans to the Great Outdoors,” spoke to a crowd of approximately 250 in the Humanities Lecture Hall at UNC Asheville. 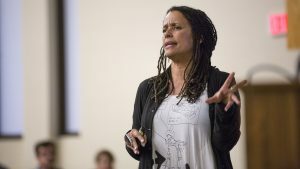 Her presentation, “Radical Presence: Black Faces, White Spaces and other stories of possibility” ranged from lively personal anecdotes to provocative discourse about relationships between people and places. Finney recounted mesmerizing stories of individuals she wrote about in her book – including her parents, John Francis, MaVynee Betsch, Queen Quet – and followed the lecture with an engaging Q & A session with the audience. Carolyn Finney made time before the presentation for a special meet-and-greet welcome reception. She also spoke to a UNCA environmental studies class earlier in the day. During her research, Finney learned that African-Americans consider the history of race relations when thinking about the environment. This history, entangled with issues of access and ownership, is a major part of African Americans’ relationship to the national parks. “For people like my parents, who worked somebody else’s land, that becomes part of who they are. And when that relationship is damaged… identity is going to be impacted,” says Finney. During the presentation, Dr. Carolyn Finney shared her research and experience including the Heroes of the Great Outdoors such as planet walker John Francis and Rue Mapp and great advice for how environmental organizations can work in reciprocity with people of color. Drop the negative story telling about people of color and the environment such as “Black People don’t hike, or recycle, or have too many other problems to care about the environment”. It is just not true and it continues to uphold an idea that is harmful to the future when over 50% of the population will be from communities of color. 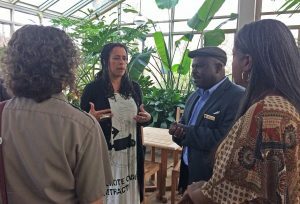 Tell stories about people of color who are heroes of the environment. Keep the stories of folks such as Jason Brown and Audrey Peterman upfront including images in the office and brochures. Look for the heroes of the environment in local communities such as Willie Mae Brown who has been a volunteer at GreenWorks for 26 years. 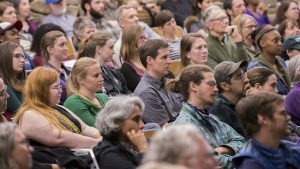 In recognition of the 100th anniversary of the National Parks System and UNCA’s Spring Greenfest 2017, Dr. Finney’s visit and presentation were sponsored by National Endowment for Humanities, The Sierra Club, and UNC Asheville, and Everybody’s Environment. Carolyn Finney, Ph.D. is a writer, performer and cultural geographer. As a professor in Geography at the University of Kentucky, she is deeply interested in issues related to identity, difference, creativity, and resilience. In particular, she explores how issues of difference impacts participation in decision-making processes designed to address environmental issues. More broadly she likes to trouble our theoretical and methodological edges that shape knowledge production and determine whose knowledge counts. Carolyn is grounded in both artistic and intellectual ways of knowing – she pursed an acting career for eleven years, but a backpacking trip around the world and living in Nepal changed the course of her life. Motivated by these experiences, she returned to school after a 15-year absence to complete a B.A., M.A. and Ph.D. The aim of her work is to develop greater cultural competency within environmental organizations and institutions, challenge media outlets on their representation of difference, and increase awareness of how privilege shapes who gets to speak to environmental issues and determine policy and action. Carolyn has appeared on the Tavis Smiley show, MSNBC, NPR and has been interviewed for numerous newspapers and magazines. Most recently an interview with Carolyn in the Boston Glove was cited as one of the top ten ideas/stories of 2014. Along with public speaking, writing and consulting, she serves on the U.S. National Parks Advisory Board that is working to assist the National Park Service in engaging in relations of reciprocity with diverse communities. Her first book, Black Faces, White Spaces: Reimagining the Relationship of African Americans to the Great Outdoors was released in 2014 (UNC Press).